Marcus Pasha Simaika (1864-1944) was born to a prominent Coptic family on the eve of the inauguration of the Suez Canal and the British occupation of Egypt. From a young age, he developed a passion for Coptic heritage and devoted his life to shedding light on centuries of Christian Egyptian history that had been neglected by ignorance or otherwise belittled and despised. He was not a professional archaeologist, an excavator, or a specialist scholar of Coptic language and literature. Rather, his achievement lies in his role as a visionary administrator who used his status to pursue relentlessly his dream of founding a Coptic Museum and preserving endangered monuments. During his lengthy career, first as a civil servant, then as a legislator and member of the Coptic community council, he maneuvered endlessly between the patriarch and the church hierarchy, the Coptic community council, the British authorities, and the government to bring them together in his fight to save Coptic heritage. 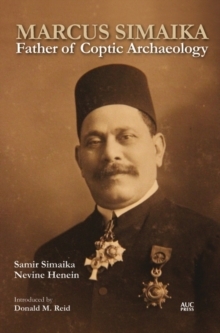 This fascinating biography draws upon Simaika's unpublished memoirs as well as on other documents and photographs from the Simaika family archive to deepen our understanding of several important themes of modern Egyptian history: the development of Coptic archaeology and heritage studies, Egyptian-British interactions during the colonial and semi-colonial eras, shifting balances in the interaction of clergymen and the lay Coptic community, and the ever-sensitive evolution of relations between Copts and their Muslim countrymen.